Adding delicate lace to your home decor is a wonderful way to add some softness or femininity to any room in your home. Simple techniques, such as wrapping a piece of lace around an object, can add some old world charm and texture to make your home feel cozier. 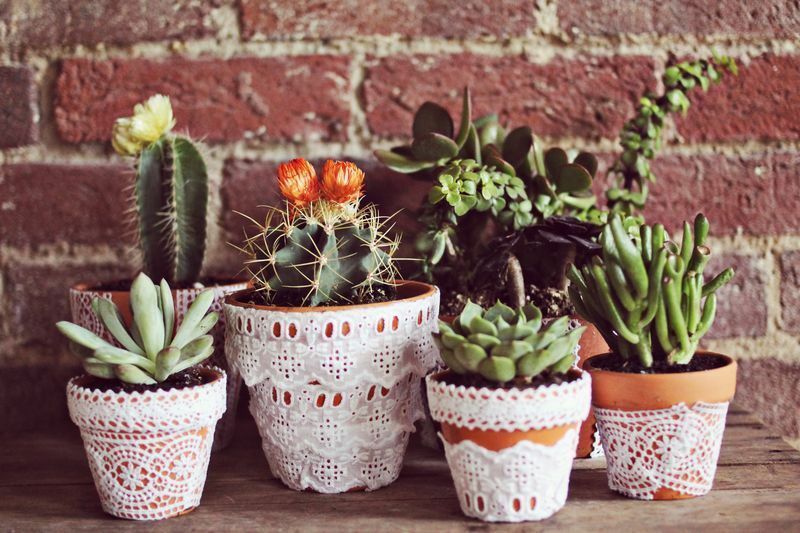 Here are 15 innovative DIY lace projects perfect for your home. Transform an old piece of furniture, such as a dresser, by spray painting over lace fabric, which will transfer the intricate design onto furniture. Add a cute lace pillow case to your couch or bed. You can use thrift store lace curtains to add to a toss cushion. This DIY pillow is also a clever way to hide small tears or stains on one of your old pillows by covering the damage with lace. Get a similar look to trendy Anthropologie lace curtains with this DIY knock-off version by simply attaching lace ribbon to the edges of your curtain panels. This simple project is a quick way to update your window treatment and can be done with fabric glue if you are not skilled at sewing. Enhance your boring glass candle holders by wrapping them with a small piece of lace to create a set of lace candle holders for your home. The best part about this DIY project is as the candle burns, the light shining through the lace will create gorgeous light patterns onto your walls. Every house needs a variety of vases to hold fresh flowers. Instead of placing your flowers in a bland glass vase, make yourself a spectacular lace vase that looks just as beautiful as the flowers. Cover regular terra cotta pots with lace to create some decorative planters that will be just as lovely as the plants growing within them. The next time you are hosting a dinner party, group several of these DIY gold lace tea light candle holders in the center of the table for a sophisticated centerpiece. To make your set of lace tea light candle holders, wrap a piece of lace around the tea light and then spray the exterior of the holder with paint. Take a plain glass vase and stick a piece of lace washi tape around the vase for the perfect lace stencil that you can use to paint a lace design onto the vase in your favorite color. Once dried, the completed vase will be the perfect way to display fresh flowers on your dining room table. Kids love having their own play spaces reserved just for them. This amazing DIY teepee can be made by covering a wood frame with lace. The thin, transparent covering allows parents to keep watch on their children while they play within the tent. Transfer a lace pattern onto a notebook to create pretty stationary perfect for school or work. These DIY lace notebooks also make an excellent gift for people who enjoy writing in travel journals or diaries. For an easy and fun DIY project, try covering wood clothes pins with small pieces of lace. The completed lace clothes pins are a pretty way to hang photos in your home, or even to hang laundry on your clothesline. Making a lace applique accent pillow is easier than you might expect. You can make one by cutting out various shapes out of lace fabric, and sew the pieces to the front of a premade pillow cover. This project is a wonderful way to use up the extra scraps of lace you have from previous DIY projects. The next time you need to wrap a gift, such as for a wedding or birthday, try using a piece of lace on top of a sheet of wrapping paper to decorate the gift. The wrapped present will look like it was professionally wrapped from a high-end boutique. Create the perfect spot to store small items, like rings or change, with this lace-printed bowl. You can quickly make this small decorative catchall bowl using polymer clay and a lace doily or silicone lace mold. Do you have curtains that aren't quite long enough? Lengthen them by adding a piece of lace to the bottom of your curtain panels to make them the perfect fit for your windows. For a subtle look, match the lace ​extension to the color of your curtain fabric, or highlight the beautiful lace design by using a contrasting color, such as black lace on white curtains.